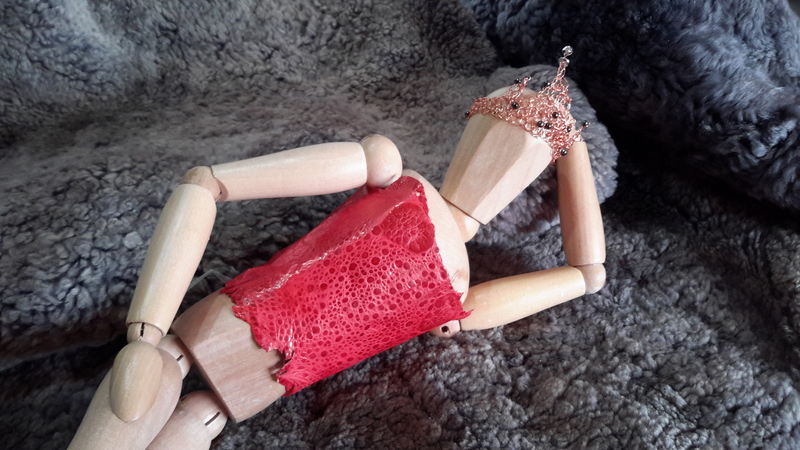 Crowning a cane toad skin corset – Craft-a-licious . .
Best not come here in winter though, as it’s cold and windy – unless you’ve got a caravan, then you’ll also be lucky enough to have the space to make a corset for a 40cm tall articulated dolly of indeterminate gender, just like I did! Just chillen in my corset and crown ..
Procure some cane toad leather (mine was paper thin), just be sure to try and get one that has its glands positioned at breast height and width-wise on the doll. Glue it onto a piece of lightweight nonwoven fabric, making sure there’s quite a bit of extra fabric around the leather. 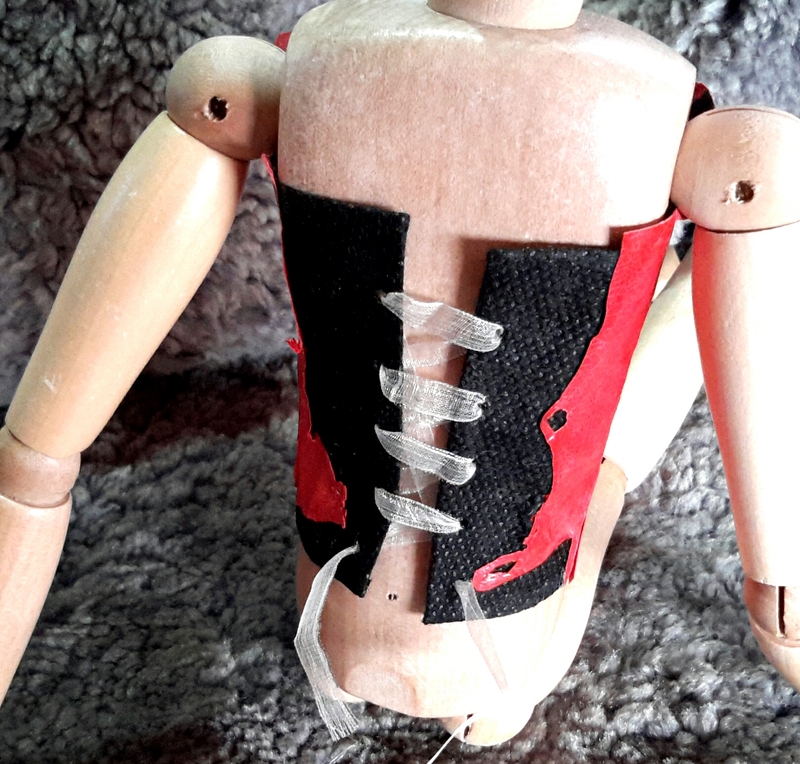 Make a dartless pattern for the corset using doll’s body measurements, remembering to add allowance for back closure and seam allowances around it’s perimeter, which will be glued down with PVA for strength. Sit down with a cup of coffee and biccies to reflect and make sure all is well with the pattern. Taking scissors – cut out corset and glue down the seam allowances. Sit down with a congratulatory coffee and chockies if it’s all working to plan; otherwise hit the alcohol cabinet. Soldering iron worked marvelously on lacing holes! Closure was done on the back by burning holes into the nonwoven with husband’s brand new soldering iron, making sure the fabric is folded 3 times on each side where holes are positioned – for strength. Also making sure husband is not in vicinity due to his anxiety levels that wonderful wife will somehow harm his tools (wrong! ..well, not very often..). Thread ribbon through the newly created holes. Stand back and admire your work, whilst deciding what sort of suspender-idge you’ll need for the stockings, and how on earth you are going to make them. It doesn’t take long to whip up one of these little beauties! Why not make a bejeweled crown whilst you’re at it? 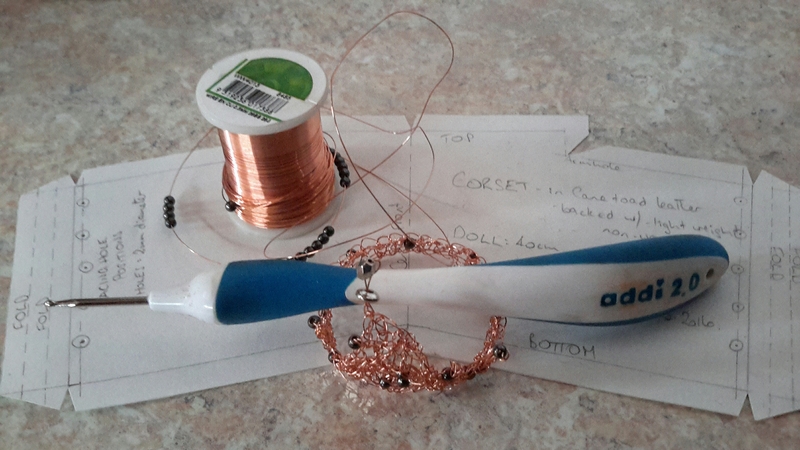 Just get hold of a 2mm crochet hook and some 0.3mm copper wire, thread on some beads, then do a round of chain to fit the doll’s head. A row of double crochet into the chain, then 3 rows of double crochet for the central point, decreasing at both ends of each row – whilst randomly sliding a bead or two into your work. Do a couple of minor points on each side for balance. Satisfactorily gaze at the crowning glory you’ve created. Create anything – anywhere, that’s my new motto! Best wishes on your creations all going to plan or, at least, your drinks cabinet is well stocked.. Very clever. I didn’t know toad skin was tannned and used for things. Yes, it really is a lovely, fine leather. This one was skived really, really thinly as it’s usually used for inlays into other leather projects. They do come in wonderful colors though! Thanks Trishy! I am rather pleased how it turned out, and am quietly chuffed that I remembered how to transfer dart allowances from the centre front to the centre back of the pattern. Yes, every girl needs to make at least 1 crown in their lives – and that’s a brilliant idea to throw it on then go shopping in it! Miss Julie – thanks for your amazement! When will you start a blog so I can follow your prolific fabulousness? Toad skin leather? This is amazing, I just love your miniature world! Thanks Karen! … now if I could only attend more felting classes to become a better felter I would be a very, very happy woman! Cath, does the corset come in ladies size 16-18?! I love the jewel colour and the tiny itsy weeny details. Well done! Arnt you currently carrying a hand tremble & dodgy finger injuries? So focused! Trashy’ll find out the hard way that the locals don’t hold wiv no crown-wearin on the mid north coast. Espesh not at Woolies. That’s a Melbourne thang. Deb, unfortunately I’d have to find the dinasorus caneus toadus species from the jurassic period to make one of these in that size! .. but, you never know what the op shops may stock. Thanks for noting current finger and hand disabilities, which do ‘t seem to be improving damnit! Deb, I have to applaud Trish for tryen to bring a bit of Melbournian kulcha to kmc’s woolies – someone has to start the trend!